Summary: Henry and his best friend Wayne were together on Mount Mansfield in Vermont when Wayne died in an accident. The two boys had a lucky marble that they passed back and forth. When Henry’s mother accidentally gives away his jeans that have the marble in them, Henry knows he needs to get it back. The clothes were destined for New Orleans to help victims of Hurricane Katrina. They end up with Zavion, a boy with demons of his own after barely making it out of his flooded house. The two boys’ paths cross in New Orleans. Eventually, they end up on the top of Mount Mansfield, where they are able to begin the process of healing together. Pros: This is an emotionally powerful story, with chapters alternating between the two boys until they finally meet up. The story of what happened to Wayne is slowly revealed, but not told fully until the very end. Short chapters keep the story moving quickly. Cons: Much of the action of the story is internal. For elementary readers, this might be a better choice for teacher-guided reading than independent. Summary: A boy is awoken by his cat. Everything is dark, but the cat urges him to go outside. Outside, there is darkness and shadows. Nocturnal animals gather around them. Suddenly it seems as though everything is waiting, anticipating something big that is about to happen. Slowly, the shadows and darkness disappear, colors start appearing all around them, as the sun rises higher and higher, and a new day begins. Ages 3-8. Pros: The illustrations by Caldecott Medalist Mordicai Gerstein are spectacular. Most of the book is in grays and blacks and perfectly captures the moments just before sunrise. The last few pages show a gradual infusion of color that show the creation of a new day. Cons: The text is somewhat secondary to the illustrations. Summary: Starting with a pig in a wig on a boat in a moat, the story goes on to need a frog, a dog, and a goat on a log, a rat with a hat on a trunk with a skunk, and so forth. When the boat gets too crowded, the pig in a wig starts unloading her boat, but loneliness compels her to wish for a bigger boat to accommodate everyone. 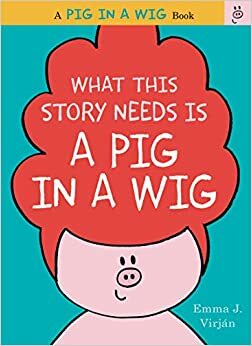 This appears to be the first book in the “A Pig in a Wig” series. Pros: A delightful easy reader, with rhyming words and repetitive text making this a good choice for beginners, as well as a story that both readers and listeners will enjoy. Ages 3-7. Cons: The next book in the series isn’t being published until 2016. Summary: What animals come out at day? How about at night? Each two-page spread in this book looks at two similar animals, one diurnal and one nocturnal. For instance a mother woodchuck leads her babies through the same fields by day as the mother skunk and her offspring by night. 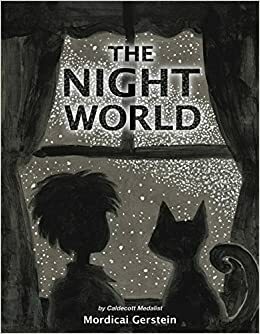 The final pages provide a thumbnail painting and description of all the animals shown in the book; I learned a new word from these pages, crepuscular, which refers to animals that come out at twilight or dawn. Ages 3-8. 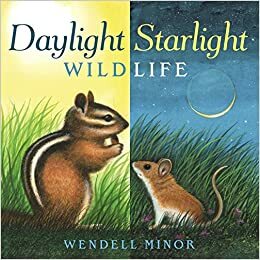 Pros: The book will encourage young children to observe nature in their own backyards at different times of day and night. The paintings are beautiful. Cons: The text doesn’t quite reach the same soaring heights as the illustrations. Summary: Golden retriever Ranger is back for his second time-traveling adventure, this time to Ancient Rome. He meets Marcus, a slave boy who works for a gladiator trainer, and Quintus, a new gladiator who is afraid he’s made the wrong decision. 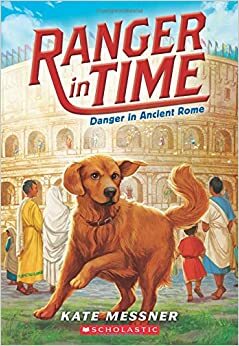 Ranger, whose search-and-rescue career was cut short because of his inability to resist squirrels, is able to use his finding abilities in a number of adventures, including a fire, Quintus’s disappearance, and the final brutal fight in the Coliseum. Despite the odds being stacked against them, Marcus and Quintus find satisfying happy ending, and Ranger is able to go back to his 21st-century family. Grades 2-4. Pros: Readers ready to move on from the Magic Tree House will enjoy this time-traveling adventure that features a lovable dog. Cons: Life was pretty tough there in ancient Rome. There are a few harrowing references to the public executions that preceded the gladiator fights. Admittedly, curling up with a good mystery on a hot summer morning isn’t quite as good as a cold winter’s night, but you won’t want to wait another four months to read these whodunits. Nell Warne’s only living relative left is her Aunt Kate, but Kate’s too busy with her job as the first woman private eye at the Pinkerton Detective Agency to have much time for an 11-year-old orphan. Can Nell prove herself enough of a sleuth to win over her aunt? 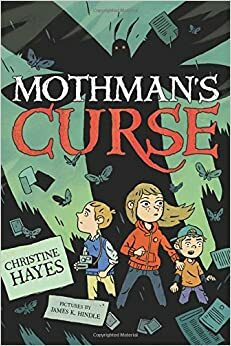 Mothman’s Curse by Christine Hayes, illustrated by James K. Hindle. Published by Roaring Brook Press. When siblings Josie and Fox discover an old Polaroid camera that creates pictures with a ghost in them, they know they have a mystery on their hands. Little do they know that the ghost will lead them to the evil Mothman, whose presence is said to portend disaster, and who starts to make appearances in their town. 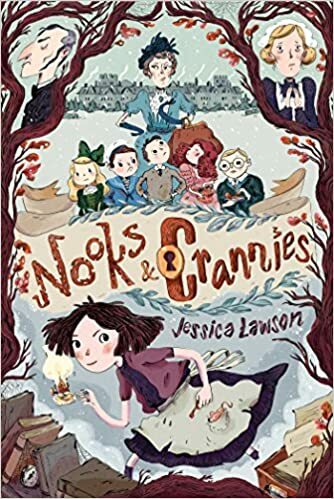 Nooks and Crannies by Jessica Lawson. 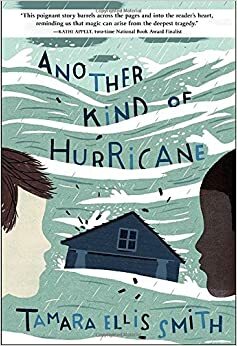 Published by Simon and Schuster Books for Young Readers. 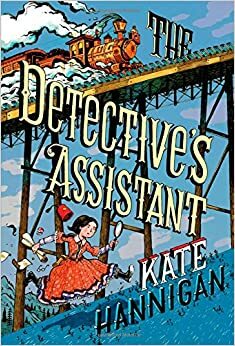 Agatha Christie meets Roald Dahl in this Victorian-era thriller featuring amateur detective Tabitha Crum. When Tabitha and five other children are invited to a mysterious countess’s estate, they think they may be there to inherit a fortune. One by one, the children begin to vanish, and it’s up to Tabitha to figure out where they are before it’s too late. The Curious Cat Spy Club by Linda Joy Singleton. Published by Albert Whitman & Company. Kelsey, Becca, and Leo happen to be in the same alley at the same time…and they discover three kittens in a dumpster. They decide to form the Curious Cat Spy Club to solve the mystery of where the kittens came from, ultimately uncovering a pet-napping ring right in their own neighborhood. Summary: Benjamin Bear has a series of brainstorms, pretty much one on each page. Every page has a title, with a comic strip that tells the story of Benjamin having a clever idea to solve a problem. This is part of the TOON Books collection, and it’s a Level 2, which means there are 300-700 words, with short sentences and repetition. It’s all explained at the back of the book, along with a guide for how to read comics with kids. Ages 4-8. 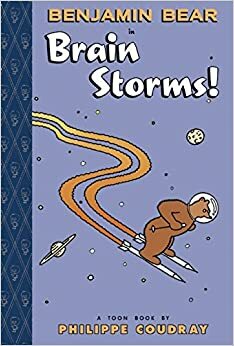 Pros: Apparently, TOON Books have been around for a while (this is the third Benjamin Bear book). They seem like an appealing option for beginning readers. Cons: Okay, I wasn’t exactly splitting my sides over the humor, but this would probably tickle the funny bone of someone who routinely cracks up over the antics of Elephant and Piggie.